​Hello good friends, and my apologies for dropping off the face of the earth without a word. My thoughts are simple (as might be evident); I didn’t have anything interesting to say. If it wouldn’t interest me, I can’t expect it to interest someone else. And then I kinda got sucked into the whole lazy thing. The garden has wound down. Last night was our first real freeze. Frost on the windshields and brown pepper plants. I’m waiting for the rest of my free brown materials to fall from the sky. In the meantime, I fashioned a large leaf-collection bin, made from 20-some year old materials that were sitting in the barn waiting for their moment in the sun. The cold brings out the chainsaw. 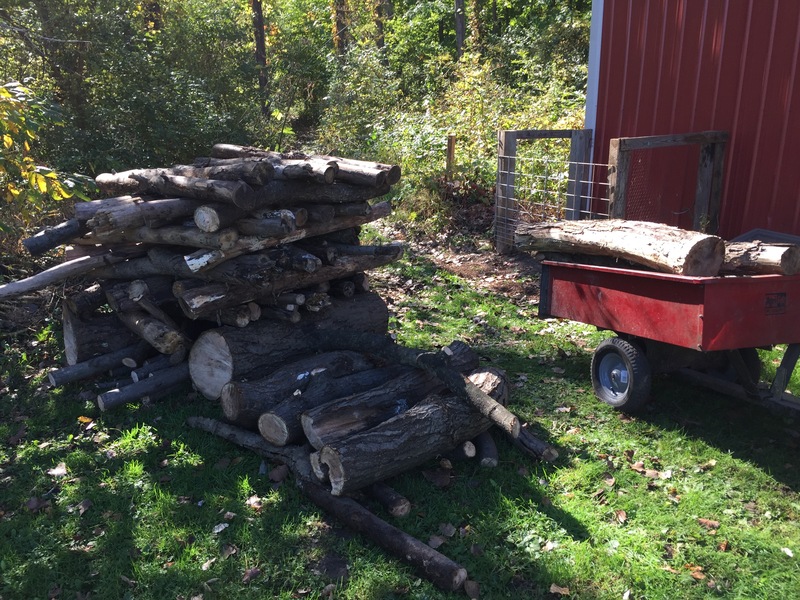 I use only deadfall trees from the property for firewood, and the scrub trees that die and fall are usually dry enough to use the same year. This year has been a little lean as far as deadwood. There was a nice big oak down, but that has to season till next year. It might just be a year for buying a little wood that some other fool cut up. I’m coming to the realization that cutting and splitting firewood in quantity is a younger man’s game. Somewhere along the way, I messed up my wrists and thumbs, and handling a chainsaw doesn’t suit me for long periods, nor does crawling around on the roof cleaning the chimney. But I’ll keep picking at it until I have to say uncle. There’s not much activity in the garden. 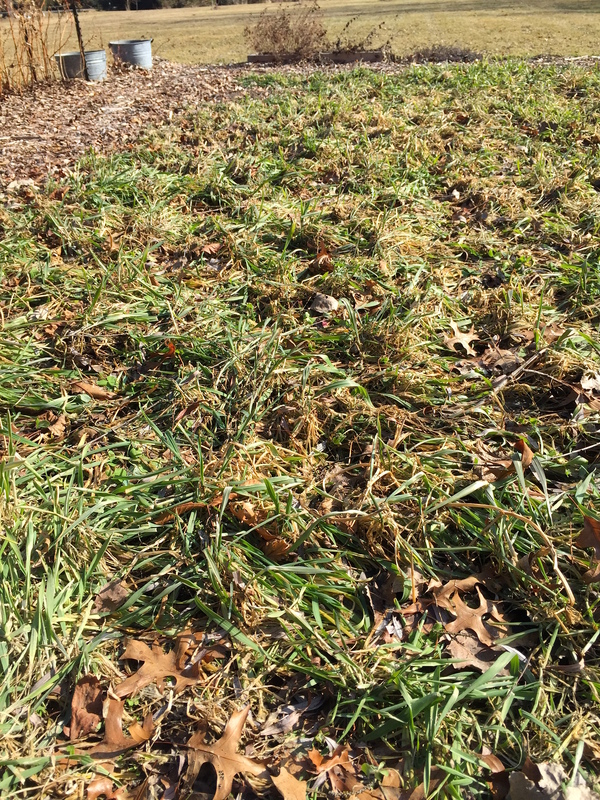 My fall cover crop mix is doing its job without complaint. 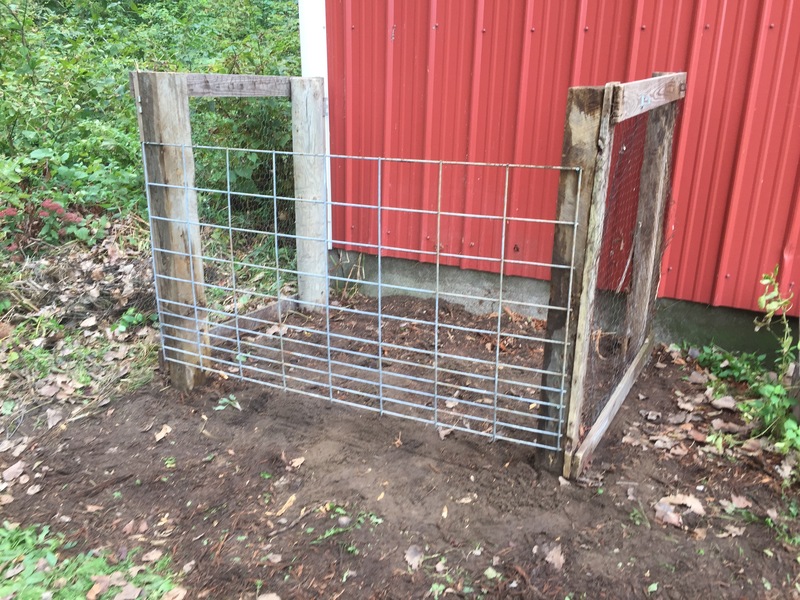 After watching the deer happily grazing on last year’s crop, I decided to strategically place tomato cages to nip that kind of thing in the bud. So far so good. I planted garlic and shallots today in the space occupied by this year’s compost bins. 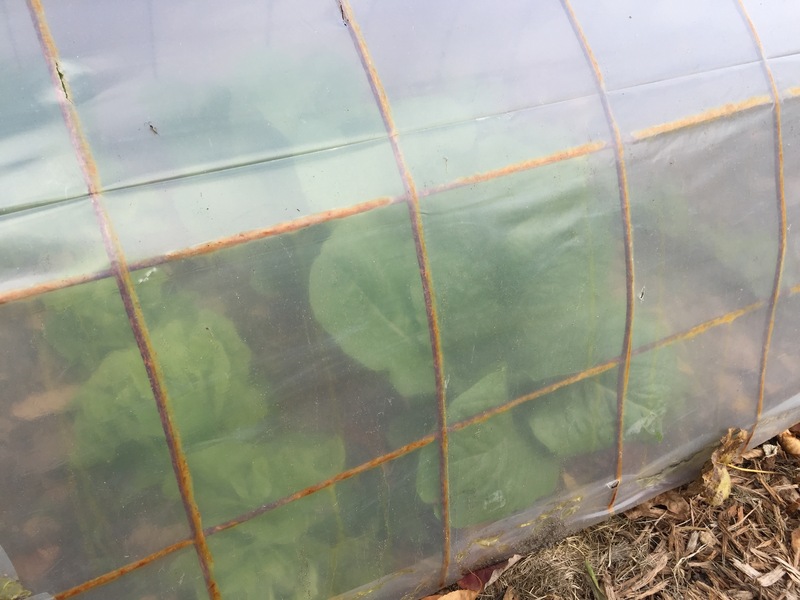 And the lettuce plants that I sowed indoors in August are hitting their stride under a cloche. It’s good to be back in the saddle. But I reserve the right to be lazy at any time I choose. I’m pretty happy. Somehow the sad, downy mildew-ed pickling cucumber vines stayed alive long enough to produce another batch of cucumbers. So yesterday morning I grabbed the cukes, dill, garlic, grapevine leaves and jalapeños form the garden and knocked out a few jars of hot dill spears. 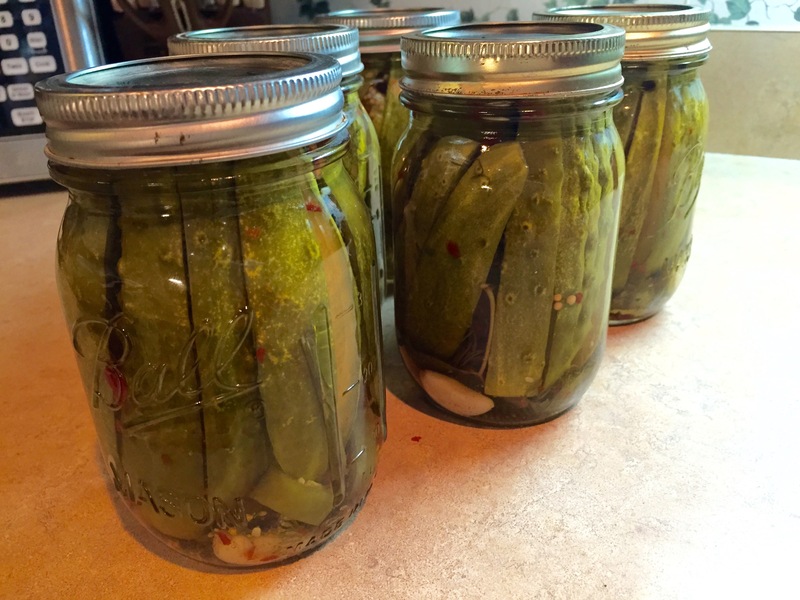 I cherish these pickles in the dead of winter. Hot and crunchy and full of vavoom on a cold, snowy night. Next, on to a good way to make use of the glut of fresh eggs coming our way from the happy hens. I’ve never eaten, let alone made, pickled eggs. But they sound interesting. 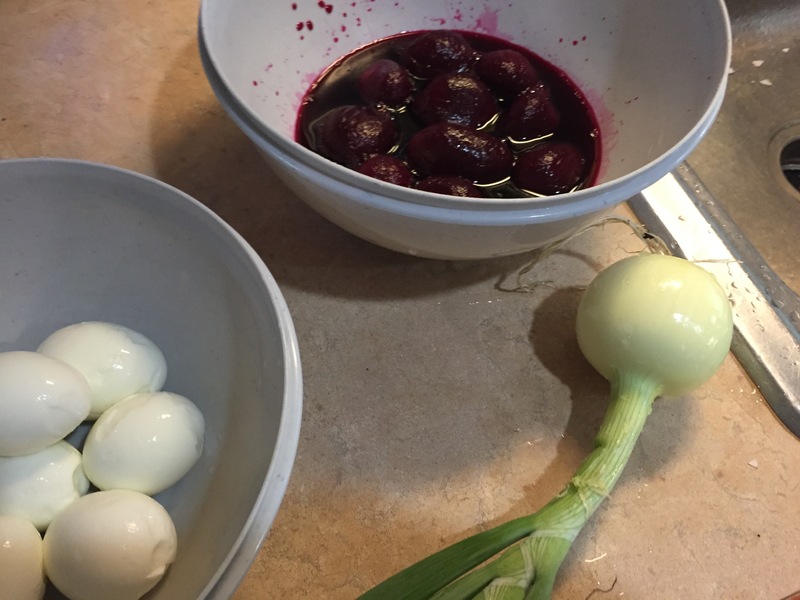 The recipe calls for adding canned beets to the boiled eggs, vinegar and spices. I don’t think I like beets, so this is a leap of faith. Who knows? Maybe there’ll be beets in the garden next year. 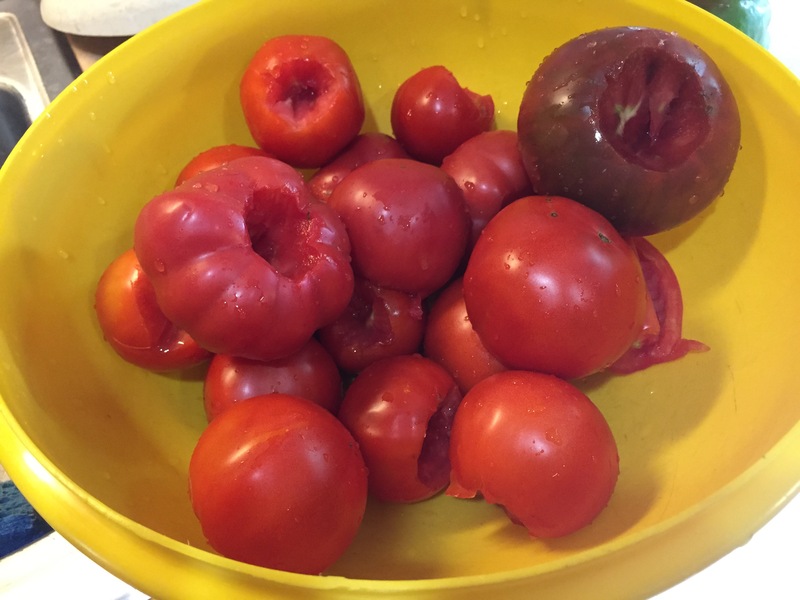 I think the very best way to put off processing tomatoes is to core them and put them in a ziplock bag in the freezer. That way there’s no pressure to act before they rot. After they thaw they’re easy to peel, and still plenty fresh. And you don’t have to cook every time a new flush of ripe tomatoes comes in. The first buckwheat cover crop that I planted is blossoming, so that means it’s time to turn it into green manure. Thought I’d try it the easy way this time. Out came the chicken tiller. They did a fair job, but they need to work on technique. You don’t just eat the good parts, girls. 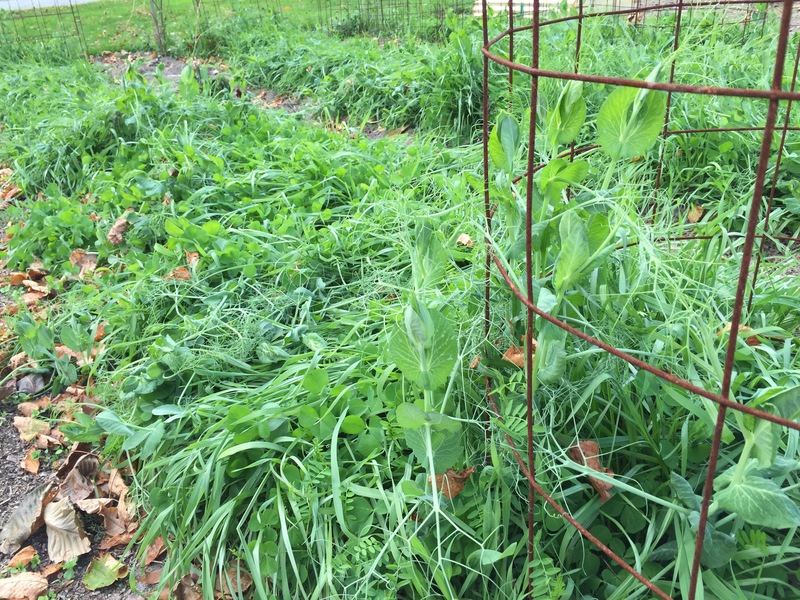 It probably defeats the purpose of green manure to swap it for real manure. Maybe not. I’ll need to think about that one. As with most any aspect of life, knowing your strengths and weaknesses and using that knowledge can make things a whole lot happier for you. 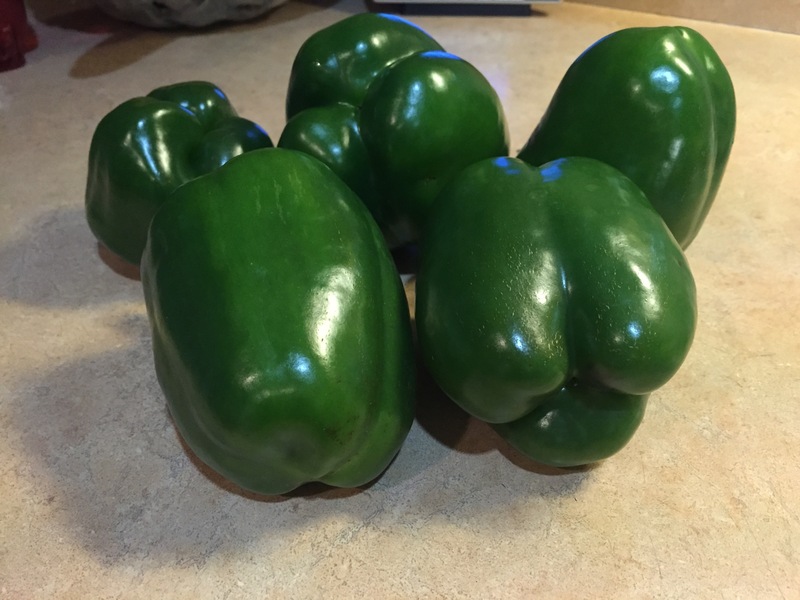 Over the years, I’ve observed that generally I can grow better tomato and pepper seedlings of the varieties I want than I can buy at the local greenhouse. By the same token, there are a lot of seedlings offered at the grower’s that make my efforts look sad. I try to play to my strengths. Cole crop seedlings bought from the local greenhouse always always seem to be much more robust than those that I grow. Same with some lettuces. I don’t know why, and don’t much care. It’s perfectly fine by me. I’d rather buy healthy seedlings (even if maybe some artificial helps might be used in growing them…I don’t ask) than nurse along sub-par seedlings using my limited indoor light space. I’m not looking to be organically certified. I know what I put into my soil and onto my plants, and none of it is synthetic chemicals. But there’s no point starting out with sickly plants. I hadn’t planned on planting a large chunk of the garden yesterday. But a look at the 10-day forecast was all it took to get the juices flowing irretrievably. It was off to the greenhouse for some of those maybe (but probably not) organic seedlings. In went the cauliflower, broccoli, cabbage and some lettuce plants. I basically covered the tilled ground with most of my stash of shredded leaves from last fall, then made planting holes through the leaves. Uh. That’s frightening. No-till with twice the work, plus tilling. I may need to listen to my good friends who’ve been commenting that permanent mulch is a really great system. 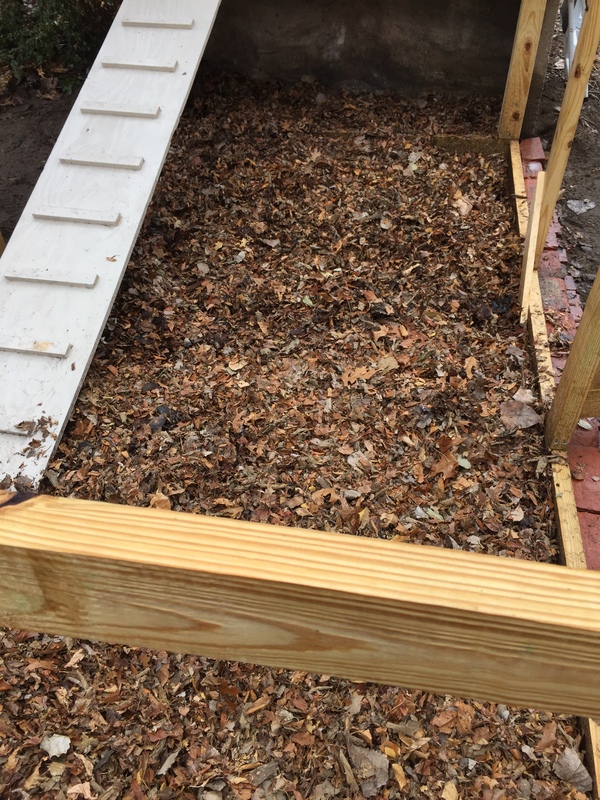 A couple of concerns about permanent mulch systems; planting seeds in permanent mulch still seems a little clunky to me. We’ll see. I’m not sure where green manures would fit into a permanent mulch system either. 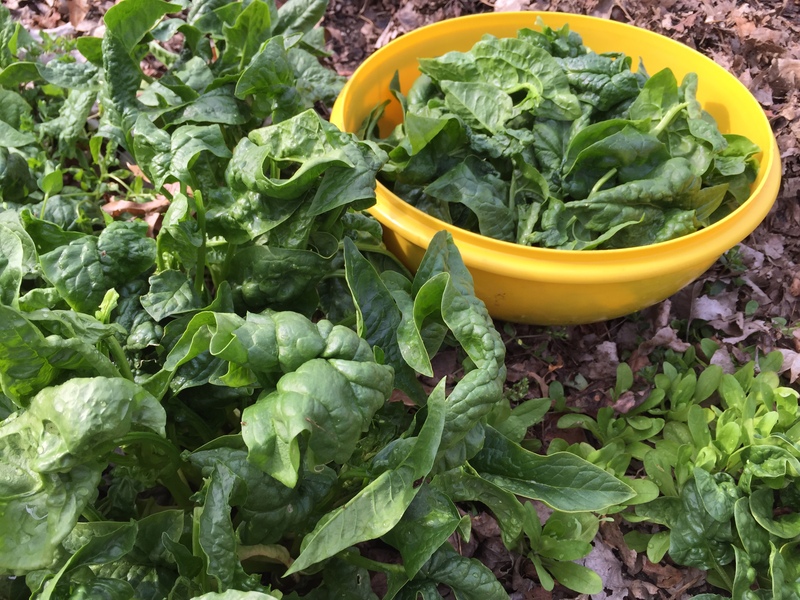 I don’t believe that a permanent mulch of mostly leaves would provide all the nutrients that certain plants might need, and green manures work so well. That’s a concern. Mine’s a fairly large garden, and leaves are the only massive waste resource that’s available. Even with the huge cache of leaves I hoarded last fall, there’s not quite enough to cover the whole plot. 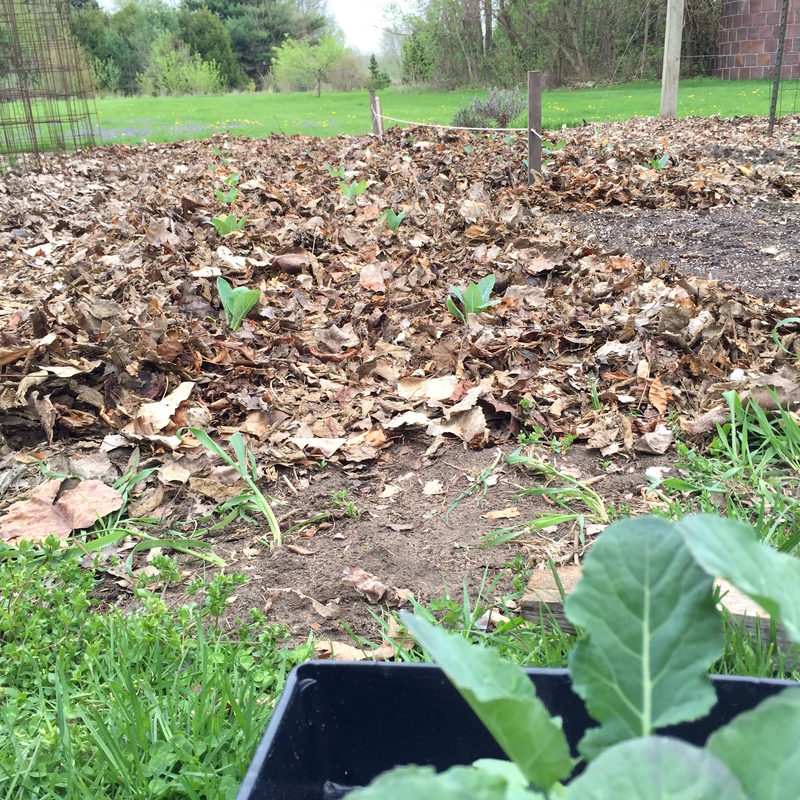 Oh, and the biggest drawback that I see to permanent mulch is that it’ll take forever for the soil to warm up in the spring. Pulling it all back kinda defeats the ‘permanent’ part of the equation, no? Still, something to think about and learn. That’s what I love. It never ends. PS…the old tried and true works pretty well too. The smell of Spring soil. Finally. After an early morning snow, it all melted and I decided to go for it. With our loamy sand, there’s never been a problem tilling early. I’ve had clay too, a long time ago, and that would just turn into brick if I tilled too soon. The soil turned over nice and black and dirty. So some of the cover crop is turned under and doing its final work of decomposing. It’ll need at least a few weeks of cooking before it’s ready to plant. Sure is nice to see that patch of black again. 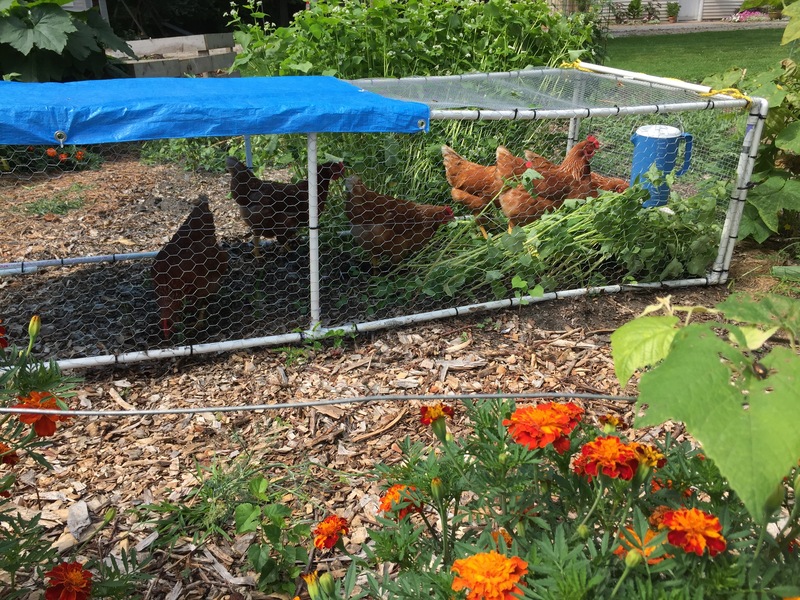 The chicken pen got four bags-full of shredded fall leaves (yeah, you really never have enough by summer). Might as well let the chickens shred them more and mix in some fertilizer. 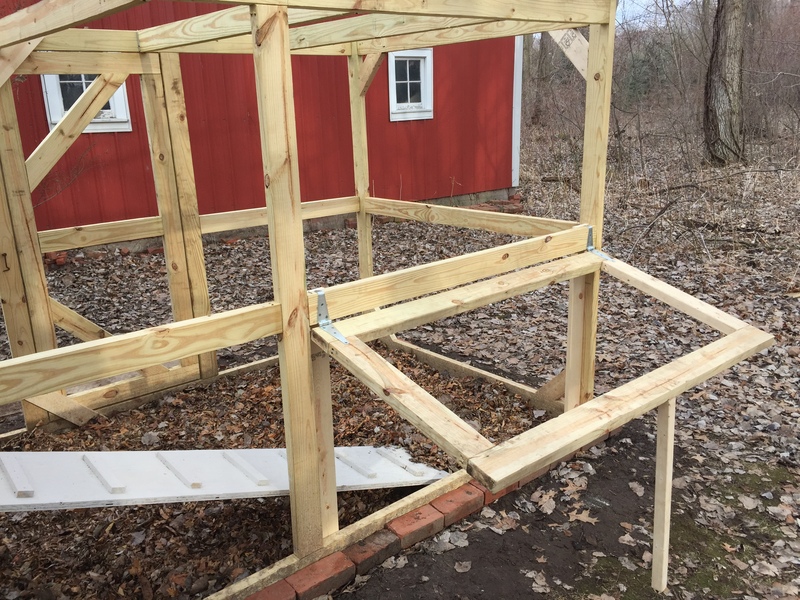 I added a small side door to the coop for navigating the chickens into a yet-to-be-made chicken tractor. And I was notified that the Black Jack No. 57 rubberized coating that I ordered for painting the coop floor was cancelled because it was out of stock. After I waited two weeks for it. Dorks. I just shrugged and bought some paint. But it won’t be warm enough for painting till next week. Oh well. I’ll twiddle my thumbs and wait. I’m really not a poetry guy at all. But I remember [in Just-] by E. E. Cummings from back when I was [in Just-] my young person days. Those lines make me happy. It never ceases to amaze me what some plants can endure. 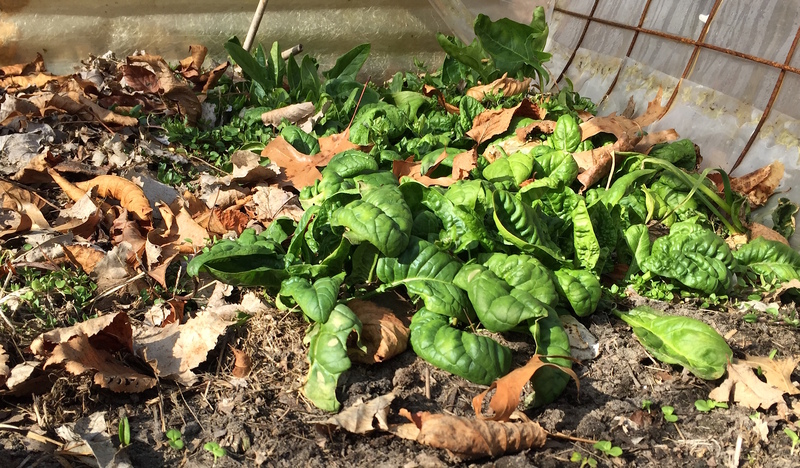 The spinach that I planted last fall is doing better than it ever was [in Just-] a thin shell of plastic, after enduring temperatures of -20°, and the coldest February this region has ever experienced. My iron pipes should be so durable. In case you don’t read comments, I want to acknowledge one that made me feel silly and smarter at the same time. 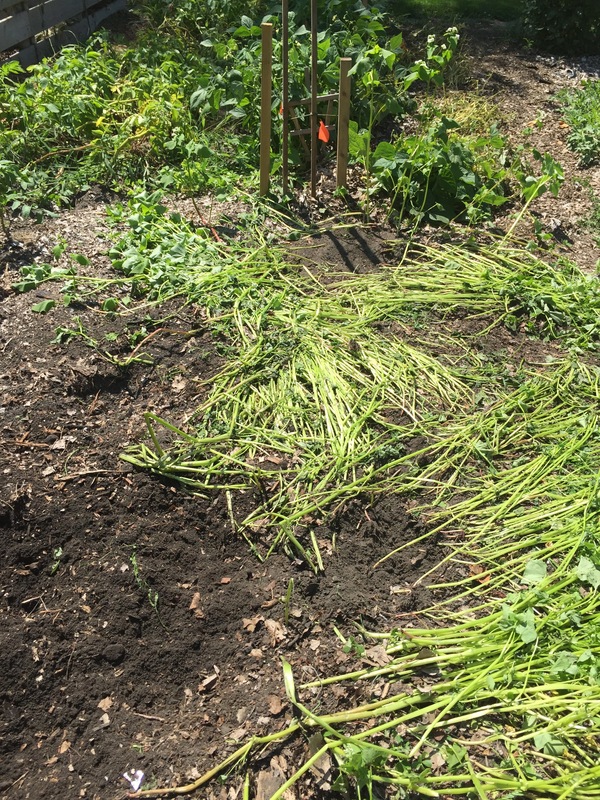 Garden cover crops slash green manures come in lots of shapes and sizes and varieties. One of my favorite is Buckwheat. Buckwheat isn’t a nitrogen fixer like legumes or hairy vetch, but its fibrous roots pull up phosphorus, calcium and minerals to be used by your next generation of greenery. It gets tall quickly, and then tops itself off with white flowers that tell you it’s time to murder it and bury its remains. 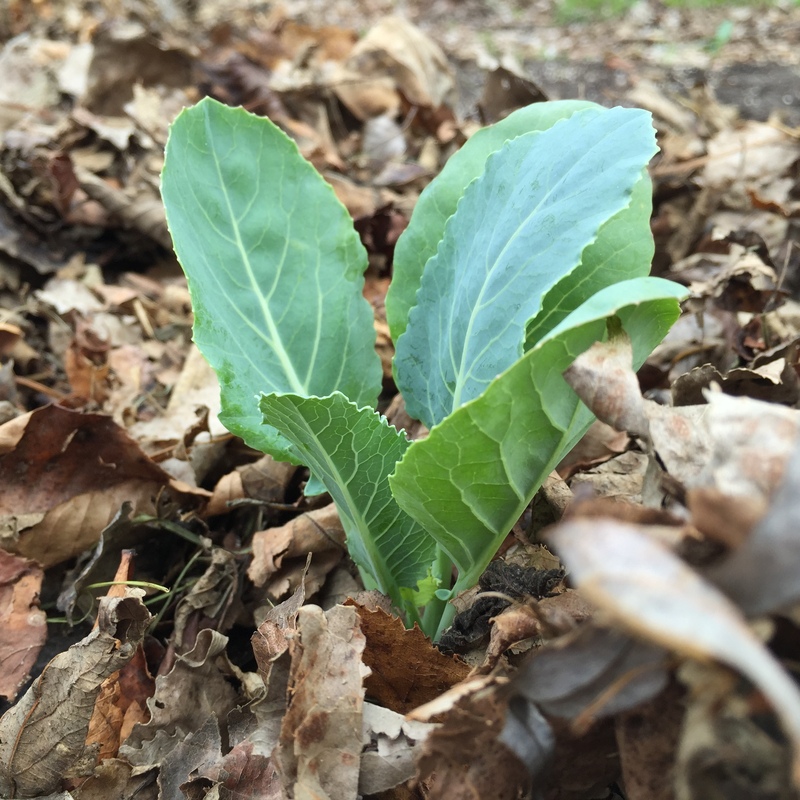 There’s plenty of growth to turn under or leave as mulch, even after just three weeks if you’re in a rush. It does a fantastic job of shading out unwanted spring or summer weeds, because it sprouts quickly and grows fast. 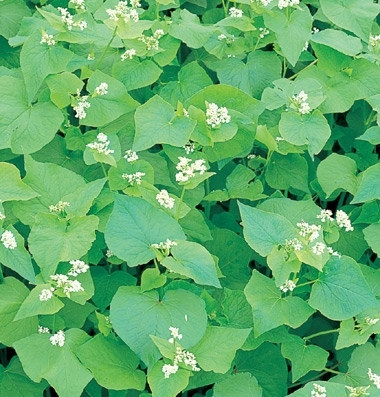 I plant buckwheat in sections of the garden where earlier vegetables are finished producing. And you can use it in Spring to add organic matter and keep weeds in check until you plant your warm-weather crops. It won’t take frost, but since it matures so quickly you have some extra leeway. I get my buckwheat seed from Johnny’s, 1 pound of organic goodness for less than $6. 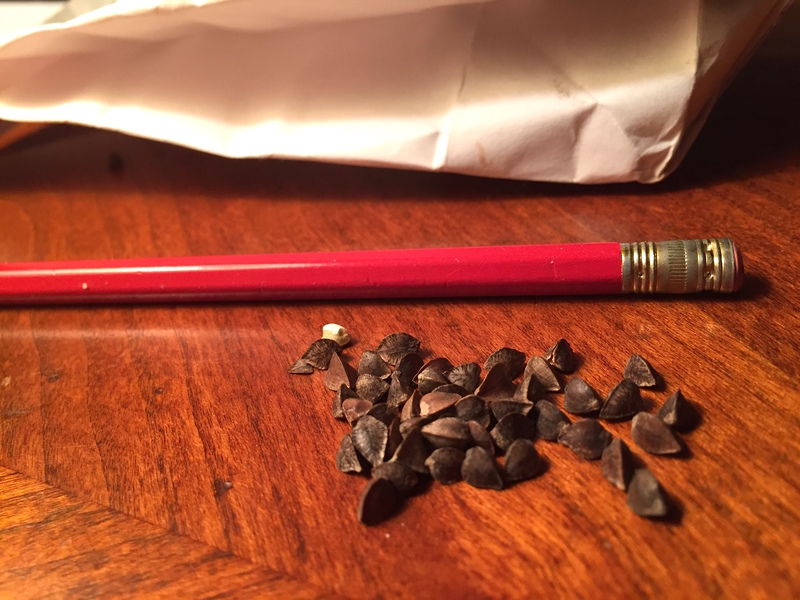 Seeding rate is 2-3 lbs./1000 square feet, but since I just spot-plant, I still have seed left over from the fall sewing to start out the spring garden from just the single pound. It’s nice to have on-hand. Maybe add a little to that outrageously long seed order that you haven’t placed yet?